Clicker 2 for PIC32MZ is a compact PIC32 development kit with two mikroBUS™ sockets for click board connectivity. It carries the PIC32MZ 32-bit microcontroller (1 MB Live-Update Flash and 512 KB SRAM) with FPU from Microchip. With a built-in USB-HID bootloader the Clicker 2 for PIC32MZ it easy to program. 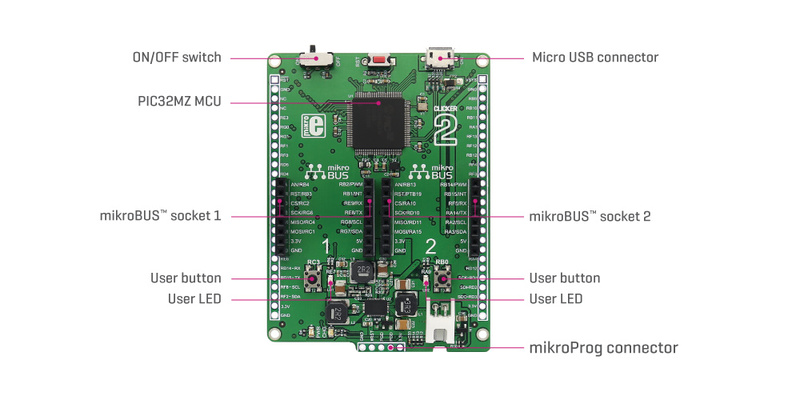 The board features everything you need to get started: a PIC32MZ microcontroller, micro USB connector, two mikroBUS™ sockets, two LEDs and additional buttons, reset button and headers for interfacing with external electronics. Take advantage of the constantly expanding range of hundreds of click boards™ - the two onboard mikroBUS™ sockets allows you to add new functionality to your project. Each click board™ comes with a set of working example code.